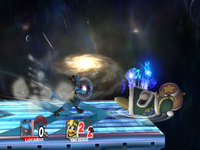 Lucario using his forward smash against King Dedede. Notice the high range of Lucario's forward smash. Range, also known as reach, is a general term used to describe how far an attack's hitbox reaches relative to the attacker. Range is measured based on how far an attack extends from a character when in a stationary position. Attacks with disjointed hitboxes generally have more range, such as many of Marth's attacks, Shulk's aerial attacks in Smash 4, and Bayonetta's Wicked Weaves smash attacks, allowing them to attack opponents from a safe distance. On the other hand, many grabs have poor range: a user must get in very close to be able to connect with them, which is usually risky to do. Projectiles in general have very long range. Although various attacks have various ranges, certain characters tend to have longer reaches than others, allowing them to space more easily. For example, most characters with a weapon (sword, hammer, etc) have longer range than ones who don't. Characters with short range are forced to approach more often, while those with longer range can afford to camp. Larger, heavier characters such as Bowser tend to have better reach than smaller, lighter characters such as Squirtle in exchange for a larger hurtbox. There are attacks that are considered to have "long" range when actually a character is just rushing ahead to attack. An example of this is Wolf's forward smash in Brawl. Additionally, there is also variation in attack hitboxes. Moves like Falcon Kick generally cover a lot of ground, but the range is only as long as his leg. Skull Bash and Green Missile cover more ground, but the character's hitbox is their entire body. Wario Bike is unique in that it covers ground as well, but is actually an item that attacks. Sonic's side special and down special are special: his body is the hitbox and he keeps going after connecting, but keeps momentum.